We moved to North Idaho from Colorado in 2004, have been farming in the Dufort Valley since 2006, and milking Golden Guernsey cows since 2011. It is a family affair – with Paul and Debra, and our adult and young kids all pitching in day in and day out to achieve the mission! The mission of Pleasant Meadow Creamery is to glorify and honor the God of the bible by being faithful and diligent stewards of His resources in order to produce amazing dairy products for our local community including three counties – Bonner, Kootenai, and Boundary. We will continually strive to produce great milk, great cows, healthy organic fields, and well-paying rewarding work for body, soul, and spirit. 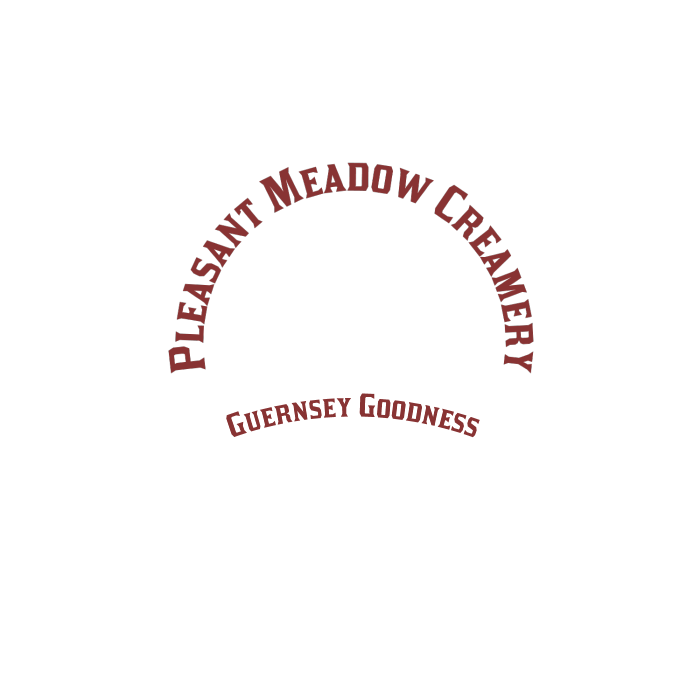 Pleasant Meadow Creamery is an Idaho Guernsey raw milk dairy committed to providing you with wholesome 100% grass-fed, non-GMO based raw Guernsey A2A2 cow milk as God intended milk to be. In 2019, we will also introduce a vat-pasteurized option for our products available both in Idaho and Washington. We are doing this because we believe people in Spokane should have access to glass-bottled, grass-fed, Guernsey Goodness! For Guernsey cows to produce the most wholesome, healthy, and great-tasting milk, their diet is very important. For six months of the year, the cows are out on irrigated pasture, eating fresh grass and clover. They have fresh grass, shade under trees, fresh air, and plenty of fresh water and exercise. These cows live a bucolic life like you would imagine a certified organic family dairy should be. These are not “factory cows”. When conditions are not ideal to be outside, the girls eat mixed grass hay and haylage and sleep in a planer shavings-bedded pack bedding barn. They have outdoor access every day and in fact spend probably half or more of their waking day outside during the winter. They are not on concrete, and do not sleep in little stalls, but rather live a rather natural life on the pack and on the snow, and on the bare ground, freely milling about with each other. They do not eat TMR – total mixed ration, but rather eat whole stem hay and haylage (a fermented hay that is baled soon after cutting and is almost like feeding fresh grass in the winter). We don’t put additives in their grasses. They do get an OMRI approved certified organic mineral mix to keep them balanced and healthy. During milking, we feed the girls certified organic grain. It contains lentils, peas, barley and wheat from Eastern Montana. We also feed OMRI listed free choice salt from Redmond Agriculture. This salt is mined in Utah and provides important trace minerals that may be lacking in the local grasses/soils and helps the ladies keep up with all the nutrients going out into the healthy Guernsey Goodness they produce. All of this – the best food, air, water, exercise, and rest, helps the girls keep up with their energy and other physical needs while producing high cream, high quality Guernsey Goodness. We do not feed corn or soy. Our goal for each cow is that they live long and productive lives. We don’t push production, and we don’t push having calves. We let each one’s individual bodies dictate what they give us and we make the best of each. This is called good stewardship of what has been entrusted to us. The farm has a creek running through it and has two high output wells that bring very pure water from 300 feet deep in a gravel layer beneath us. These wells are used to water the stock and to keep the pastures green throughout the summer. This way, the cows are always eating the best, while we have the opportunity to really make a lush cover of the ground to out-compete weeds, build up soil organic matter, and even provide a home for a plethora of worms! All manure on the farm is composted for a season after the winter pack is done, and we spread this compost on the pastures and hay fields every late fall just before snow flies. Our goal is to continuously increase topsoil and make this land far healthier through the years than how it was when we began our stewardship of it. We use chickens, ducks, and wild turkeys to sanitize the pastures after the cows graze them. Flies are controlled with a natural wasp fly predator. Bees are allowed to flourish, and pesky pests are controlled by sparrows we encourage to live here by putting sparrow houses in the eaves of every building. We are a local dairy – selling milk directly off the farm in Sagle, and at retail stores in Sandpoint, Athol, Rathdrum, Post Falls, Hayden, Bonners Ferry, and Coeur d’Alene, Idaho. We appreciate your support of our efforts.